Swiss police say they’re investigating a suspected case of arson at an Islamic center in eastern Switzerland. The Islamic Central Council of Switzerland has filed charges against a Swiss politician for incitement to commit a crime after he appeared to welcome the recent shooting of a Muslim and called for more such shootings. The shooting in St Gallen appears to have been part of a family feud. Police arrested a man who was found in the mosque holding a handgun. Reem Abu-Hayyeh, Graham Murray and Liz Fekete examine the role of the Swiss People’s Party in the recent referendum to “stop mass immigration” into Switzerland. Voters in Switzerland narrowly backed a proposal to limit immigration Sunday, in a blow for the government after it had warned that the measure could harm the Swiss economy and relations with the European Union. The decision follows a successful last-minute campaign by nationalist groups that stoked fears of overpopulation and rising numbers of Muslims in the Alpine nation. Opinion polls before the vote put opponents of the plan in the lead, but as ballot day neared the gap began to close. Swiss public television SRF reported that some 50.3 percent of voters eventually backed the proposal to introduce quotas for all types of immigrants. About 49.7 percent voted against it, a difference of fewer than 30,000 votes. Support was particularly strong in rural areas, while cities such as Basel, Geneva and Zurich rejected the proposal. On 9 February the Swiss electorate will vote in a referendum on a proposal to reintroduce immigration quotas. The initiative, “against mass immigration”, by the right-wing Swiss People’s Party has been gaining ground, with an opinion poll last month finding 43% support for the proposal, up 6% since December. Le Temps has reported that other right-wing forces backing the initiative have seized the opportunity to promote their own rabidly Islamophobic agenda. 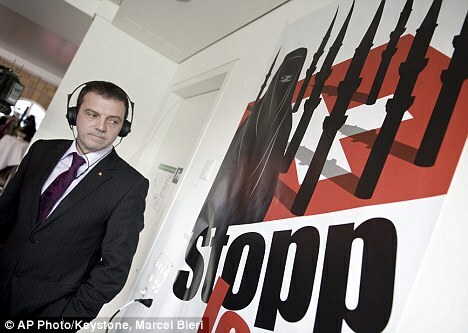 The Egerkingen Committee, which co-ordinated the successful campaign for a “yes” vote in the 2009 referendum over a proposed ban on minarets, is using the current anti-immigration campaign to denounce the threat of “creeping Islamisation”, warning against a “massive increase in the Muslim population” that would alter the “essence of Switzerland”. 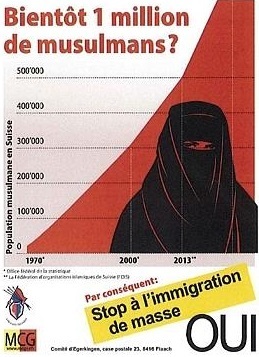 It has produced a poster that recycles the image of a woman wearing a full veil previously used in the anti-minaret campaign and predicts that there will soon be a million Muslims in Switzerland. Voters in Switzerland’s Italian-speaking region on Sunday slapped a ban on wearing full-face veils, a move condemned by the country’s Muslim community and Amnesty International. 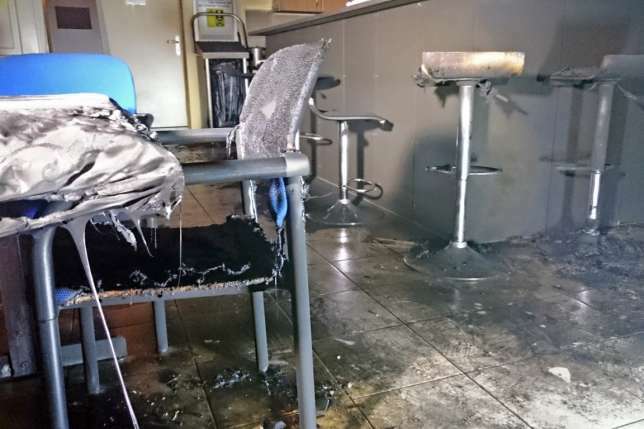 Results from a referendum in the southern canton of Ticino showed that 65 percent of the electorate backed a proposal to forbid the covering of faces in public areas by any group. Echoing bans in France and Belgium, the measure does not single out Muslims directly. It states that “no-one may mask or hide their face on the public highway, nor in places open to the public, except places of worship, nor those offering a public service”. But in a clear nod to the Islamic tradition of veils for women, it adds that “no-one may require another person to cover their face for reasons of gender”. On September 22, Ticino will become the first Swiss canton to hold a referendum on banning face-covering headgear in public places. Political commentators say the initiative has good chances of being accepted. Burkas, full-body cloaks worn by some Muslim women, especially in Afghanistan, are few and far between in the Italian-speaking canton in southern Switzerland. According to official estimates, only about 100 women in Switzerland wear them. The Ticino initiative does not explicitly target Muslims – the phrasing to be voted on is “nobody in public streets or squares may veil or hide their face” – but in practice it means women in burkas. The law would apply to burkas and niqabs, Arabic face coverings with a slit for the eyes often worn as part of a full-body covering, but not to headscarves. Until now, burka bans haven’t stood a chance in Switzerland. Yet pundits believe Ticino could write history and become the first canton to introduce a ban on all face coverings – similar to the controversial one already in force in France – into the cantonal constitution. Swiss parliamentarians narrowly voted on Friday against a ban on wearing the Muslim burqa and other face coverings in public places, including public transport. The lower house of the Swiss parliament rejected the motion pushed by the canton of Aargau in a vote of 93 to 87.